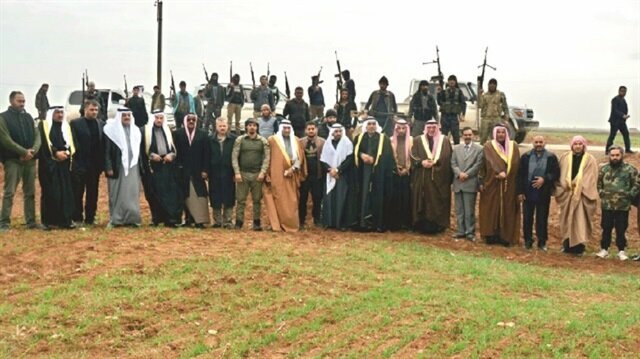 The Supreme Council of Syrian Tribes and Clans has vowed to fight against terror organizations and liberate regions under the terrorist Kurdistan Workers’ Party (PKK)’s Syrian affiliate, the PYD, pledging Arab tribes’ support for Turkey in any upcoming operation inside the country. Speaking exclusively to Yeni Şafak, the head of Syria’s Supreme Tribal Council and leader of the Shuayitat tribe Rafea Oqla al-Rajw said that the union formed during the group’s last meeting in Turkey’s Şanlıurfa back in March included 60 clans and 20 tribes, encompassing over 80 percent of those found in Syria. Elected as head of the council at a meeting that took place during Dec. 10 -13 last year and attended by 354 tribal leaders, al-Rajw noted that the symposium was also attended by tribal heads from Saudi Arabia and Qatar, and it aimed at protecting Syria’s territorial integrity and fighting against all terror organizations, including the PKK/PYD. “The PKK/PYD are our most dangerous enemy. We will not abandon our country to any occupying forces such as the PKK/PYD, Daesh, Russia and the regime and its affiliates, the U.S. or Iranian militias. Even if the PKK says it fights against Daesh, they’re two terror organizations that are one and the same,” said al-Rajw. Al-Rajw pointed that former regime official General Sukkar al-Moussa al-Hayyal, who was one of Daesh’s emirs, currently lives in a palace in PKK-occupied regions, pointing that PKK terrorists seized the deeds, IDs and properties of those fleeing Syria. “We will regain control over our lands even if we have to fight with forks and spoons. In order to begin work on restoring the infrastructure in these areas, we first have to eradicate the PYD occupation,” stressed al-Rajw. “We set off as tribes in coordination with Turkey. However, we don’t receive funding from Turkey, we get that from the tribes in Kuwait and Qatar. Our blood and our path is the same as Turkey’s. We can only play a role with Turkey by our side,” said al-Rajw. “We definitely have no contact or links on this issue with either the U.S. or the West. This is a completely false accusation. We’re against the American project. They’re behind terrorism. They summoned their gangs and terrorists from Mount Qandil. The U.S. is actually the party that creates and spreads terror,” continued al-Rajw. “We know very well that Europe is just like the U.S., they don’t look out for the Syrian people’s interests. The only fraternal and friendly country who has Syrians’ best interest is Turkey,” al-Rajw stressed. Turkish Foreign Minister Mevlüt Çavuşoğlu said peace efforts in Syria would remain elusive if terrorist organizations are given a free hand and weapons.In an op-ed, 'This is how to bring peace in Syria', written in international Newsweek magazine, Cavusoglu said the U.S. support to PKK/PYD/YPG is "an effort going terribly awry".The PKK/PYD and its military wing YPG are Syrian branches of the PKK terrorist network, which has waged war against Turkey for more than 30 years.Cavusoglu said: “The vision for a politically united and territorially integrated Syria will be elusive if separatist terrorist organizations are given a free hand and weapons to advance their goals.”Reiterating that the fight against terrorism cannot be won by siding with one terrorist organization against another, Cavusoglu said: “It is the very core idea of the NATO alliance that the security of an ally is prioritized over short-term tactical gains that only help create a vicious cycle of violence.”Cavusoglu also said that the Geneva process should be “resuscitated”.“Paying lip service to its primacy as the essential platform in the political process takes us nowhere. The international community has to make the best out of all means at its disposal. "Discussing a presidential summit in Russia's Sochi city last November, he said Turkish President Recep Tayyip Erdogan had laid down two conditions for the upcoming Sochi congress in January.They include: "a clear and strong link with the UN-mediated Geneva process" and "a clear rejection of anyone affiliated with terrorist organizations, including PYD/YPG”.Sochi is the designated venue of the Syrian National Dialogue Congress, set to be held on Jan. 29-30 with the participation of nearly 1,700 people.Cavusoglu called the Syrian conflict "the worst humanitarian crisis since World War II” which led to "the emergence of a global threat".He said that Turkey had suffered the most from terrorist organizations such as Daesh, Nusra Front and PKK/PYD/YPG.He added that Turkey-backed Free Syrian Army had cleared a 2,015-square-kilometer Syrian territory from Daesh and eliminated 2,647 terrorists.“Turkey spent $30 billion to meet the needs of 3.4 million Syrians seeking refuge in their northern neighbor. Free access to medical care, education, as well as the right to join the labor force have been extended to our Syrian guests to help them better integrate into their host society,” Cavusoglu said.Cavusoglu added: “Almost 70,000 Syrians have returned from Turkey to the liberated areas.”Syria has been locked in a vicious civil war since early 2011, when the Assad regime cracked down on pro-democracy protests with unexpected ferocity.Since then, hundreds of thousands of people have been killed and more than 10 million others displaced, according to UN officials. “We back all operations carried out by Turkey in Syria. We stand united with Turkey. We’ll even be at the forefront so that no harm will come to Turkey. We spoke before with the tribes located in Idlib and they expressed their desire for Turkey to intervene, noting that they are ready to put an end together to the PKK and Hayat Tahrir al-Sham terror, pledging all kinds of support. We also supported the Idlib and Euphrates Shield operations. Today there are a few problems in the Euphrates Shield regions. Some groups have different agendas,” said al-Rajw in reference to any possible cross-border operation by Turkey. “If it weren’t for Turkey, there wouldn’t be such a region and people wouldn’t have been able to come back. We know that we’re forever indebted to the Turkish people and we want to do whatever is necessary in this regard,” concluded al-Rajw. In the wide-ranging Euphrates Shield Operation launched in August 2016, the Free Syrian Army -- with the support of the Turkish army -- had cleared 2,000 square kilometers (772 square miles) of land along the Turkish-Syrian border of terrorist elements. Turkish Foreign Ministry on Wednesday summoned the U.S. Embassy Charge d’Affaires Philip Kosnett in capital Ankara to express its “discomfort” over the U.S support for the PKK/ PYD terror group, according to a diplomatic source.The U.S. weapons training of PKK/PYD terrorist organization members was discussed when Kosnett was summoned to the ministry, the source, who spoke on condition of anonymity due to restrictions on talking to the media, said.The U.S. and the coalition have largely ignored PYD/PYG links to the PKK, which the U.S., EU, and Turkey lists as a terrorist group.Anadolu Agency previously reported that the PKK/PYD terrorist organization, which has seized a quarter of Syrian territory, was forming a so-called army with the support U.S.Iran, Russia 'should fulfill responsibilities’ in SyriaAlso previously, the U.S. said they would continue to support the PKK/PYD in Syria's eastern Raqqah and Deir ez-Zor province, home to some of the country's most productive oilfields.The latest news comes after the U.S. Central Command (CENTCOM) Commander Gen. Joseph Votel announced on Dec. 22, 2017 that they would establish border forces in Syria, which he said would help prevent resurgence of Daesh.A group of around 400 terrorists were reportedly trained by the U.S. through the Pentagon and the CIA near eastern Aleppo's Tishrin Dam on the Euphrates River and in southern Hasakah province. The U.S., which already opened a hospital for the Kurdistan Worker’s Party (PKK) in Afrin, is preparing to build an airport for civil aviation for the service of the terrorist organization in Raqqa.Regional sources report that occupation activities led by U.S. Special Envoy for the Global Coalition to Counter Daesh Brett McGurk, which have been followed by a political and bureaucratic process for the past two years, have reached its final stage.The U.S. has accelerated the process for a legitimate establishment and declaration of the pirate structure called “United Federal State in Northern Syria” on a 30,000 square-meter occupied territory allocated for PKK, according to reports.U.S. Defense Secretary Jim Mattis has dispatched a “diplomatic team” to PKK/PYD occupied areas, primarily the eastern Euphrates region, in preparation to officially recognize a terrorist PKK “state.”Raqqa to be the capitalRaqqa, which was completely devastated during the operations held under the pretext of the fight against Daesh, has been selected by the U.S. as the capital of the terrorist state. The U.S. will allegedly initiate a massive construction project in the city of Raqqa, where they will also build a civilian airport. The tenders that will be awarded to Western construction companies will be sponsored by Saudi Arabia and the United Arab Emirates (UAE).Brett Mcgurk allegedly claimed that “Raqqa would be an alternative to Aleppo with its industry, entertainment and commercial hustle and bustle” in a meeting with top figures of the Kurdistan Worker’s Party (PKK) terrorist organization in Hasakah.A gambling centerThe U.S. plan also includes the construction of giant hotels and opening branches of globally-recognized casinos in Raqqa, which, after Dubai, will thus become the second largest gambling and entertainment hub in the Middle East.The U.S.-led idea of building the terrorist PKK “state” consisting of nine ministries has also been agreed on by the terrorist organization. Pro-PKK figures from Switzerland, Germany, France and the U.S., who have been trained in U.S. bases by American experts, have been selected for political and bureaucratic cadres, primarily for the ministries of petroleum, construction, industry, education, defense and communication.U.S claims that seven countries will recognize the terrorist stateThe U.S. has pledged to Qandil, the PKK’s terror headquarters, that seven countries would recognize the pirate state when its establishment was publicly declared. Certain Gulf countries are known to be among them. Moreover, representative missions of the pirate state in Northern Syria will be opened in more than 30 countries in 2018.The PKK is listed as a terrorist organization by Turkey, the European Union and the United States. The PKK has been conducting armed violence in the southeastern part of Turkey since 1984. More than 40,000 people, mostly civilians, have been killed in the three-decade long conflict.